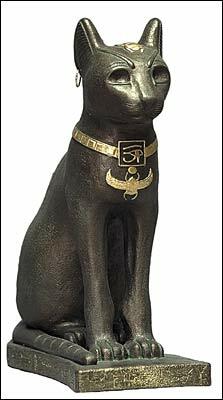 The Egyptian goddess Bastet, also known as Bast, Ubasti and Baset, has been worshipped since the Second Dynasty. In the third millenium BC, she was depicted as a priestess with the head of a lion. Later, in the first millenium BC, with the popularity of the house cat, her lion’s head often transformed into that of a cat. Though her physical image differed, her demeanor did not. She remained both tame and wild, gentle and fierce. Daughter of the sun god Ra, she is also known as Lady of Flame and Eye of Ra. She is wife to Ptah, god of carpenters and shipbuilders, and mother to Nefertum, who it is said was called forth from a lotus flower to help raise the sun into the sky. Unlike other goddesses, Bastet has a very unique duality. When her head is that of a cat, she is a moon goddess, and when a lion, she is a sun goddess. It is in these very powerful aspects of nature that she reminds us that to be true to oneself requires the acceptance of our own opposite natures. With her feline mystique she is associated with playfulness, grace, sexuality, and affection, though none can deny her predatory nature. Contradictorily, it is this very predatory aspect that made her a protection goddess, much in the same way a domestic cat protects the crops and food stores by killing vermin. Priests of Bastet’s temples were known to keep sacred cats who, when they passed over, were mummified and presented as offerings to the great goddess. To do harm to any cat would not only bring her wrath, but also that of the community and justice systems, as the penalty was death. 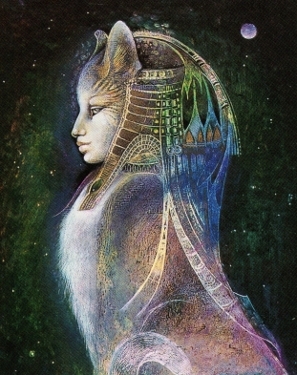 Bastet shows us the eternal sacred quality of the feminine, along with the beauty of a feral protectress. She reminds us that solitude and independence shows strength, but also that unity in relations binds our souls. You can honor her with offerings of sweet liquids and foods, mint, honey, statues of cats, items of silver or gold, or a bowl of cool water placed on your altar. people of Ancient Egypt worshipped a goddess who’s duties included protecting cats.